How to Win Democratic Campaigns in Collin Co. The Democratic Party of Collin County has posted an announcement on its website that it is joining with the Democratic Campaign Development Coalition (DCDC) and Texas Democratic Women of Collin County (TDWCC) to put on a series of education seminars they are calling "How to Win Democratic Campaigns in Collin Co." The DCDC group is sponsoring the seminars. According to a spokesperson for DCDC the group has recruited a number of guest speakers from across North Texas who have experience organizing GOTV activities and running political campaigns as well as some former North Texas Democratic candidates. "We hope to have Precinct Chairs, active Democrats and possibly some potential local candidates from Collin and several surrounding counties attend some or all our training days," said the spokesperson, "Anyone who wants to help Democratic Candidates win in Collin Co. and North Texas is invited to sign up for the training"
The county party organization is charging a nominal registration fee to cover the cost of producing the training program. Registration for the class is now open. For registration information go to the announcement posted on the Democratic Party of Collin County website. Google Wave - A Future Campaign Support Tool? At Google's recent "I/O" developer conference in San Francisco, the company unveiled an intriguing new tool called Wave. Wave is a web-based, open-source platform that is designed to seamlessly integrate communication and collaboration. When Wave is available it may make an interesting campaign support tool. Take a look at it in action: video left. NYTimes.com: A New York Times/CBS poll again finds that 65% of Americans want a public health care option, while only 26% opposed such a plan. Those polled also responded that they feel President Obama has not clearly explained the main points of health care reform. Fifty-five percent said he had not explained his plan clearly, and many felt under-informed about the policies under discussion. Maybe it's not so much that President Obama hasn't repeatedly and clearly explained the main points of health care reform, and more that Republicans and health insurance industry lobbyists have so widely and loudly sowed fear-based mis-information, that people feel confused and therefore under informed. Have You Ever Thought About Running For Elected Office? Have you ever thought about running for elected office? With the pivotal 2010 elections fast approaching, now is the time to give it some serious thought! One great place to get experience running for and serving in elected office is by serving as a Precinct Chair in your own neighborhood. There are many other elected office positions that you might consider too. Precinct Chairs, of either party, serve as the most direct link between voters and their respective political party and and the party's candidates. Precinct Chairs help to carry the party's and candidate's message to their neighborhoods and they help Get Out The Vote for their respective party's candidates. The next Precinct Chair election for the March/April 2010 to March/April 2012 term of office occurs on Primary Election Day, March 2, 2010. Qualified candidates can file (form PDF) to have their name placed on the March 2, 2010 Primary Ballot for the position of Precinct Chair from Monday, October 5th, 2009 through 6:00 PM January 4, 2010. Contact your local Democratic County Chair to ask if a Precinct Chair vacancy exists in your election precinct and find out the requirements to run for this, or any other, elected office. To find out more about Democratic Precinct Chairs - click here. There are many other elected office positions that you might consider too. 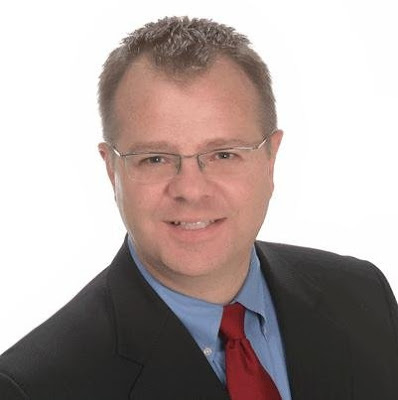 Of coarse, nearly all the elected office positions that will appear on Collin County ballots in 2010 are currently filled with incumbent Republicans, but perhaps it is time for incumbent Republicans to have a Democratic challenger in 2010, for the first time in many years. The following elected office positions will first appear on each of the March 2, 2010 Democratic Party and Republican Party Primary Election ballots and then finally on the November 2010 General Election ballot. And County and State Convention after the primaries. The filing period to have your name placed on the primary ballot runs from December 2009 to January 2010. The Democratic and Republican primary winners of each elected office position appearing on the primary ballot will then face each other in the November 2010 General Election. The following "non-partisan" local city and school board trustee elected office positions will appear on election ballot for the May 2010 city and school election. While progressive blogs, with the encouragement of DNC Chairman Howard Dean, help power Democratic electoral wins in 2006 and 2008, many in the Democratic party have been reticent about, and towards, its blogosphere echo chamber. And now it seems that reticence has carried over into the use of Twitter. Nearly twice as many Republicans as Democrats have accounts on the social networking platform Twitter (101 compared with 57), and the GOP dominates Twitter usage by an even wider margin, according to a report released this week by the Congressional Research Service that analyzed two weeklong periods in July and August. During those spans, congressional Republicans posted 932 messages — or tweets — compared with 255 for Democrats, CRS analysts found. Twitter allows users to text short messages of 140 characters or fewer from their phones, BlackBerrys or computers to their profile pages and their followers’ phones and computers. And though some experts question the effectiveness of Twitter as a political communication tool and more than a few lawmakers have already experienced the downside of the unfiltered communication it offers, Republican communications staffers have actively encouraged their lawmakers to tweet away. And so they have. Democrats seem all too willing to let it all slip away by not leveraging the new media approach to political campaigning. Conservatives Ask - What Recession? What Health Care Crisis? Paul Burka of the Texas Monthly: "This gaffe is going to stick. ... You cannot be callous and cavalier when people are losing their jobs, [their health insurance] and their homes. I don't care how ideological the Republican base is. ... Everybody knows someone who is suffering in these times." The Labor Department reported last week that 42 states lost jobs in August, up from 29 in July, with the biggest net payroll cuts coming in Texas, Michigan, Georgia and Ohio. Texas lost 62,200 jobs as its unemployment rate rose to 8% in August for the first time in 22 years. The state's leisure, construction and manufacturing industries were hardest hit, losing 35,500 jobs. The Labor Department report shows jobs remain scarce even as most analysts believe the economy is pulling out of the worst recession since the 1930s. Federal Reserve Chairman Ben Bernanke said earlier this week that the recovery isn't likely to be rapid enough to reduce unemployment for some time. The jobless rate nationwide is expected to peak above 10% next year, from its current 9.7%. Back in late July we posted that Gov. Perry, Senator Kay Bailey Hutchison, Senator John Cornyn, Congressman Sam Johnson and every Republican elected official in Texas made headlines for months pronouncing that President Obama’s American Recovery and Reinvestment Act (ARRA) economic stimulus plan was unneeded and unwelcome in Texas. Gov. Perry, the top Republican in Texas, proclaimed that federal money from Washington is so onerous to "all" Texans that Texans might rise up in revolt and secede from the United States, by invoking the 10th Amendment of the Constitution, rather than accept "Washington money." In March, Gov. Perry rejected $555 million in federal stimulus funds to fund unemployment benefits. By July, Perry was forced to ask the federal government for a $170 million loan to cover unemployment insurance. The state is expected to request a total of $650 million to fund unemployment insurance, around $100 million more than Perry originally rejected. On the issue of health insurance reform Gov. Rick Perry (R-TX) also threatens 10th Amendment secession. [Star-Telegram] Texas Senator Kay Bailey Hutchison, Senator John Cornyn, Congressman Sam Johnson and every Republican elected official in Texas have again lined up with Gov. Perry to reject the idea that Texans need health insurance reform. "[Even after removing illegal immigrants from the numbers] Texas virtually leads the nation in percentage of residents without health insurance, according to both conservative and liberal researchers. Only 49.5 percent of [Texas] residents were covered by employer-sponsored insurance, in a two-year average ending in 2008, compared with 58.5 percent nationwide, the U.S. Census Bureau estimated this month. Between 1996 and 2006, the cost of family coverage for private sector workers in Texas increased 86 percent, while incomes increased by less than 9 percent, according to the Robert Wood Johnson Foundation, which finances health care research and supports universal health coverage. Compared with the rest of the nation, the Texas economy relies heavily on small businesses and relatively low wages. So although most of the state's uninsured live in households with people who work, fewer employers offer coverage, and fewer employees can afford it. For an average family of four in Dallas, medical care and health insurance this year will cost nearly $17,000. Of that, 41 percent – almost $7,000 – will be paid by the employee, MHBT found in a survey of 139 local businesses. " The average health-care coverage for the average family now costs $13,375, according to the Kaiser Family Foundation's 2009 Employer Benefits Survey. Over the past decade, premiums have increased by 138 percent. And if the trend continues, by 2019 the average family plan will cost $30,083. About 160 million Americans receive health coverage through their employers. In general, the employer picks up 73 percent of the tab. This seems like a good deal. In reality, that money comes out of wages. As Ezekiel Emanuel, who advises Office of Management and Budget Director Peter Orszag on health-care policy, has pointed out, health-care premiums have risen by 300 percent over the past 30 years (and that's after adjusting for inflation). Corporate profit per employee has soared by 200 percent. Hourly earnings for workers, adjusted for inflation, have fallen. The wage increases have been consumed by health-care costs. In a new study, "Health Insurance and Mortality in U.S. Adults," published in the online edition of the American Journal of Public Health, Harvard-based researchers found that uninsured, working-age Americans have a 40 percent higher risk of death than their privately insured counterparts, up from a 25 percent excess death rate found in 1993. The researchers estimate that lack of health insurance causes 44,789 excess deaths annually which are hight than previous estimate of 18,000 annual deaths published by the Institute of Medicine (IOM) in 2002. “I can’t imagine that anyone from Texas who cares about this state would vote for Obama Care. I don’t care whether you’re Democrat or Republican,” Perry has said. Gov. Perry has no need to worry - Texas Senator Kay Bailey Hutchison, Senator John Cornyn, Congressman Sam Johnson and every conservative Republican elected official in Texas stand united in their support of giving the private insurance industry a free hand to increase fees annually for increasingly reduced health coverage insurance policies sold to only those most likely to not get sick. Though luck if you are unemployed and without health insurance. If you are employed, though luck, if neither you nor your employer can afford to buy health insurance coverage. Though luck, if you have insurance, but your insurance company cancels your policy as soon as are diagnosed with cancer or some other expensive to treat disease. Though luck trying to buy insurance, if you have a pre-exisiting health condition. And, tough luck, if your big corporate employer moves your job to China or India, where the government provides health coverage, to cut its overhead cost of U.S. employee private health insurance. A federal appeals court overturned campaign finance reform law regulations in a ruling on Friday that, if not reversed on appeal, will make it easier for independent "527" political groups to raise and spend money to influence elections. The ruling frees political action groups to accept unlimited contributions and to spend unlimited funds independently supporting or opposing federal candidates. The decision by the U.S. Court of Appeals for the D.C. Circuit came in a lawsuit brought by Emily's List, a nonprofit political organization that backs female Democratic candidates who support abortion rights. The group challenged several Federal Election Commission regulations, arguing that the rules violated its First Amendment rights by limiting its ability to spend and raise money to influence elections. Circuit judges Brett M. Kavanaugh and Karen LeCraft Henderson agreed that the regulations violate free speech rights. A third judge, Janice Rogers Brown, said the regulations were invalid for other reasons. "The First Amendment, as the Court has construed it, safeguards the right of citizens to band together and pool their resources . . . to express their views about policy issues and candidates for public office," Kavanaugh wrote in his 44-page opinion. Federal Election Commission (FEC) spokeswoman, Judith Ingram, said commission officials will review the opinion for a possible appeal to the full slate of appellate court judges or to the Supreme court. The FEC's 2005 regulations, now repelled by the DC Circuit Court, prevented political groups such as Emily's List from raising unlimited amounts of "soft money," donations by unions, corporations and individuals, for activities such as voter registration drives and issue advertising. 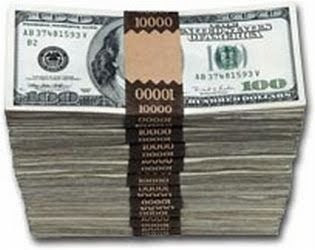 Soft money could not be donated to candidates or used to advocate the election of a candidate. During the 2004 campaign, political groups, known as 527s, aggressively raised and spent soft money to run advertisements that attacked and supported candidates. The 2005 rules were designed to rein in such behavior by requiring groups to rely more on "hard money," strictly limited donations by individuals or political action committees. The FEC regulation required political committees to use hard money for at least 50 percent of their generic get-out-the-vote efforts and voter registration drives. It also compelled the organizations to use hard-money accounts to pay all costs of advertisements that referred to a federal candidate. If a group's solicitations mentioned a specific candidate, the regulations required them to treat the donation as hard money. Judge Kavanaugh wrote that such campaign finance restrictions were unconstitutional because they limited speech by political groups such as Emily's List. The rules "do not pass muster," he wrote, adding that they did not serve an anti-corruption purpose and had been enacted to "better equalize the voices of citizens and groups who participate in the political process." You may have recently heard news accounts of a new Texas law that authorizes Bible literacy studies in public schools. The law, which went into effect at the start of the 2009-2010 school year, was passed by the Texas Legislature in 2007 and allows Texas public schools to teach from the Bible as literature or as cultural context to history. You may have recently heard news accounts of a law that deals with teaching Bible literacy in our state's public schools and went into effect at the start of the 2009-2010 school year. This law, passed by the Texas Legislature during the 2007 session, authorizes Texas pubic schools to offer a high school elective course on the Bible’s role in history and literature. Parents interested in finding out how their individual school or overall ISD plans to introduce the Bible into classroom teaching plans should contact their their local school administrator, ISD board representative, and State Board of Education (SBOE) representative. New results from the weekly Research 2000 poll conducted for Daily Kos. Most of the results are about what we've come to expect -- President Obama's ratings are more favorable than unfavorable (55% to 38%); neither congressional caucus is popular, though Dems are more than twice as popular as Republicans (39% to 18%), and the Democratic Party has a 41% favorable rating to the GOP's 23%. When the Republican Party favorability poll numbers are broken down by region, the GOP's favorable vs. unfavorable numbers are very weak in Northeast (7% vs. 87%), and only marginally better in the Midwest (13% vs. 78%) and West (14% vs. 75%). 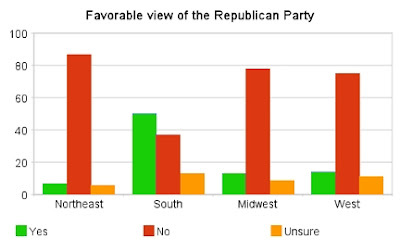 In the South, however, 50% have a favorable opinion of the GOP, and only 37% have an unfavorable view. A large part of the reason that the DC metro has had so many problems in recent years is that its tax-based funding was cut in the years conservatives controlled congress and the White House. Conservatives such as Sen. Tom Coburn (R-TX), has said that we [congress] shouldn’t steal tax money so that we can ride on the Metro. When a bill containing $150 million for emergency maintenance funding for the DC metro system came up this summer, Rep. Brady himself voted against such big government socalist spending. Conservatives who protest "socialist" government services and advocate secession from our federalist form of government do not seem to stop and think about the comforts and safety they would give up in their conservative world of no federal government. The following essay says it all. In his new book "Republican Gomorrah: Inside the Movement that Shattered the Party," investigative reporter Max Blumenthal the movement that has transformed the Grand Old Party. Last night, the President, in a blockbuster of a speech, reminded us that we all agree on the need for health insurance reform. He's right. 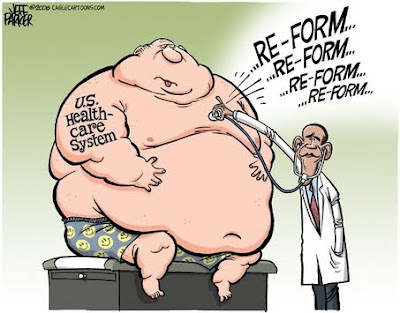 Other than a few wing nuts on the Blogosphere and FOX, every one agrees that health insurance reform is badly needed. And in all polls--ALL POLLS--large majorities of the American people agree. The House of Representatives is ready to pass a strong, deficit-neutral bill. But as usual, it's the Senate that stands in the way. But it's not the entire Senate. In fact, an easy majority of Senators are on board. But as we've all come to know, either through 6th grade civics class or recent news stories, for all practical purposes, it takes 60 votes in the Senate to pass any substantive legislation. I'll leave the details of the civics lesson to others. But what this means is that a simple majority won't do the trick--we need 60 Senators. Republicans continue to hide behind the numeric Democrat majority in the Senate by effectively saying, "If you want reform, then you've got the votes: go do it." Exactly who in the Senate is blocking insurance reform? The 12 blue dogs listed below. That's all. And here's where the most egregious antidemocratic effect lies: The Democrat Senators who are blocking reform represent barely 16% of the American population! That's right. Senators representing barely 16% of the American population are blocking insurance reform for 100% of the nation. Once again, I urge you to keep writing letters, phone banking, and doing what you do. But direct it to those folks on the list above. They are the only people who stand between us and comprehensive insurance reform. That's it: TWELVE DEMOCRATS ARE BLOCKING COMPREHENSIVE REFORM. Don't blame FOX "news" for spreading lies (they do, but we have to progress in spite of that). Don't blame tea-baggers for their Klanish histrionics (it's an apt description, but they are side show freaks). Don't blame Republican House members like Sam Johnson, Pete Sessions, or the rest of the North Texas delegation (they are irrelevant). It's just 12 dogs who need to be heeled in and made to behave like the progressives they pretend to be at election time. Last night, in what is probably the most substantive and powerful speech I've ever heard from any president, Pres. Obama rejoined the fight with fierce determination. Let's follow up by hammering on the last bastion defending the status quo: The Dozen Dogs. Gus Porter, American Legend with Thomas Haden Church from Thomas Haden Church - Video Gus Porter gets mauled by a bear, but he won't let the socialist Canadian health care fix him up, so he'll hike back to America. 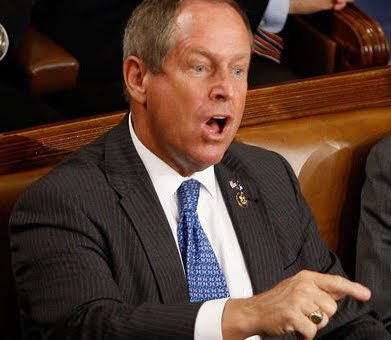 Rep. Joe Wilson (R-S.C. / picture left) called Pres. Obama a liar from the floor as the President addressed a joint session of congress. It is politicians like Rep. Wilson that are prompting increasing numbers of Americans to reject modern-day conservatism. But what's even more important is the fact that modern conservatives are failing because they abandoned the principles on which the Republican Party was founded. Responsible conservatism honors and respects America's institutions, both governmental and societal. The epithets so many on the right now hurl at Obama—"socialist," "fascist," "liar"—precisely echo the accusations Herbert Hoover and "Old Right" made against FDR in 1936. And the spectacle of citizens appearing at town-hall meetings with guns recalls nothing so much as the vigilante Minutemen whom Buckley evicted from the conservative movement in the 1960s. In the 1960's, William F. Buckley denounced the John Birch Society leadership for being "so far removed from common sense" and later said "We cannot allow the emblem of irresponsibility to attach to the conservative banner." By late Wednesday, congressman Wilson's Web site had crashed, he had taken a beating on his Twitter page and his Democrat challenger, former-Marine Rob Miller, had raised thousands of unexpected dollars online for a possible rematch with Wilson in next year's midterm elections, according to Lachlan McIntosh, Miller's campaign manager. The conservative website RedState.com, as well as many other conservative support groups and individuals, has declared Wilson a "great American hero" for his actions and launched a fundraising effort for the lawmaker. On "Countdown" Keith Olbermann offered a "Special Comment" about Republican Congressman Joe Wilson yelling out "you lie"
Finally, many in this chamber – particularly on the Republican side of the aisle – have long insisted that reforming our medical malpractice laws can help bring down the cost of health care. I don't believe malpractice reform is a silver bullet, but I have talked to enough doctors to know that defensive medicine may be contributing to unnecessary costs. So I am proposing that we move forward on a range of ideas about how to put patient safety first and let doctors focus on practicing medicine. I know that the Bush Administration considered authorizing demonstration projects in individual states to test these issues. It’s a good idea, and I am directing my Secretary of Health and Human Services to move forward on this initiative today. The Baucus version of health insurance reform would provide federal funds to help set up nonprofit, state-level cooperatives in which consumers would would have the option to purchase health insurance. Just as auto coverage is now mandatory in nearly all states, Baucus would mandate that all Americans get health insurance either through a private insurer or their local state cooperative. Penalties for failing to buy health insurance would start at $750 a year for individuals and $1,500 for families. Households making more than three times the federal poverty level — about $66,000 for a family of four — would face the maximum fines. For families, it would be $3,800, and for individuals, $950. Many doubt that replacing a national public health insurance option with fifty smaller and unassociated state health insurance co-ops is a good idea. Robert Reich: Co-ops are a "bamboozle" that "won't have any real bargaining leverage." Krugman: The "supposed alternative, nonprofit co-ops, is a sham." Jacob Hacker: Co-ops are "not going to have the ability to be a cost-control backstop." An easy way to think of the public plan's functions is the three "B"s: We need a national public plan that is available on similar terms in all parts of the nation as a backup. This plan has to have the ability to improve the quality and efficiency of care to act as a benchmark for private insurance. And it has to be able to challenge provider consolidation that has driven up prices to serve as a cost-control backstop. Baucus and his staff forgot to delete the name of the author of the Finance Committee's health plan from the Acrobat version of the document. 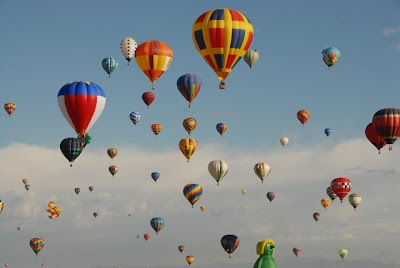 The Plano Balloon Festival is coming Friday, September 18th through Sunday, September 20th. At its usual Saturday night peak attendance level over 50,000 people will be in attendance. The Democratic Party of Collin County has had a booth at the event for years. The organization is again asking for volunteers to help cover shifts in their booth over the three day festival. Contact Micky Mayer at 972.818.9595 if you are able to help. The system doesn't work for anyone. It cheats patients and leaves them to die, denies insurance to 47 million Americans, forces hospitals to spend billions haggling over claims, and systematically bleeds and harasses doctors with the specter of catastrophic litigation. The cost of all of this to society, in illness and death and lost productivity and a soaring federal deficit and plain old anxiety and anger, is incalculable — and that's the good news. From whosplayin.com - A letter from a Lewisville ISD (LISD) parent to the LISD school board in response to the ISD's decision to block President Obama's speech to school students. . . .Before moving here, my husband and I were both Active Duty servicemembers with the United States Navy, we served proudly for a number of years. During the course of our duty we were faced with the tragedy of September 11th. For me that time was painful and frightening. . . .My reason for sharing my anecdote with you, was that during this time I never forgot that I had my country behind me. I knew that my government was doing everything in its power to protect its citizen and maintain the greatest country in the world. I knew that the Office of the President of the United States and my Commander in Chief had worked tirelessly to win the position of the most powerful man in the world and that when he spoke, we listened. Not because we always agreed with him but because it was part of the social contract of being a citizen of the United States of America. . . .After hearing the news that Lewisville Independent School District chose not to televise President Obama's speech to America's school children on the importance of an education and staying in school, I became outraged. As a veteran of the Armed Forces, I am offended that the elected officials who supervise my son's education are disrespecting the Office of the President of the United States. ...I am truly offended by what appears to be a partisan decision that you have made out of fear. . . .You are robbing my son of these moments that make him American and I will not allow to do so. We will be keeping him home on Tuesday, September 8th so he can witness first hand, the President of the United States address him directly. The GOP Wants To Save School Children From Obama! What’s In the House Health Insurance Reform Bill For Seniors? Rising health costs are hitting seniors’ wallets—with the average Medicare Part D plus Part B premium consuming an estimated 12% of the average Social Security benefit in 2010—and 16% by 2025. Medicare, the government program that provides health care for Americans age 65 and older, will be strengthened under America’s Affordable Health Choices Act. In fact, for Medicare enrollees, the House bill lowers prescription drug costs, makes preventive care free, ensures that you can keep your doctor, and improves the quality of your care. In a press conference to discuss what health insurance reform means for America’s seniors Rep. Xavier Becerra, Vice Chair of the House Democratic Caucus and senior member of the Ways and Means Committee, dispelled myths about the legislation. Rep. Becerra was joined by Richard Fiesta from the Alliance for Retired Americans and representatives from the Center for Medicare Advocacy and National Womens Health Network. What’s in the health reform bill for seniors? Ending the ‘doughnut hole’ for prescription drug coverage. The reform bill will result in lower overall prescription drug costs for seniors, according to the non-partisan Congressional Budget Office. Right now, evidence suggests the “doughnut hole” coverage gap reduces seniors’ use of drugs prescribed by their doctor by an average of 14%, posing a real health threat to seniors who simply cannot afford the drugs. So you pay nothing on recommended preventive services that will keep you healthier longer. Right now, one in five women age 50 or over did not have a mammogram in the last two years, and 38% of adults age 50 or over have never had a colonoscopy – with costs often a factor. Ensuring you have access to and can spend more time with your primary care doctor, and making sure your care is better coordinated to ensure you get recommended treatments, particularly for chronic diseases. Right now, about 12 million seniors lack access to a primary care doctor in their community. Eliminating the 21% pay cut your doctor was facing for Medicare reimbursements, ensuring that these doctors will still be able to care for seniors—especially in rural areas. Right now, without reform, 40% of doctors say they will reduce the number of Medicare patients they treat. Developing national standards on quality measurement and reporting, investing in patient safety and rewarding doctors and nurses for high quality care. Right now, nearly one in five Medicare patients who are discharged from the hospital are readmitted within 30 days—many for preventable reasons. Extending the solvency of the Medicare Trust Fund by five years, to help ensure Medicare can cover every American as they get older. Right now, the Medicare Trust Fund is projected to be exhausted in just eight years, in 2017, which could cause cuts to services and care. Focusing health care dollars on your care and benefits and cracking down on waste, fraud, abuse, and overpayments to enrich private companies. In the last year alone, improper Medicare payments that were discovered and stopped totaled more than $450 million.